Sir John Rushout, 4th Baronet of Milast (1685-1775) was educated at Eton before going on to serve as a captain in the Horse Guards between 1710 and 1712. In 1713 he was elected to the House of Commons as a member for Malmesbury, a seat he held until 1722 when he was returned for both Malmesbury and Evesham, choosing to sit for the latter and serving until his retirement in 1768. During his time in Parliament he served as Treasurer of the Navy from 1743 to 1744, when he was made a Privy Counsellor. In 1746 he nearly became Leader of the House of Commons under the Earl of Bath, but the ministry collapsed and he was never offered the position. He became Father of the House in 1762, retiring at the dissolution of Parliament in 1768, the year these pistols were made, having served for fifty-five years. By family descent until sold in the house sale at Burford House, near Tenbury Wells, Worcestershire, in March 1951. Norman Dixon, ‘Joseph Heylin, A Georgian Gunmaker 1730-1808’, The Journal of the Arms & Armour Society, vol. XVII, no. 3 (March 2002) fig. 2. Note: Only a very limited number of firearms with silver barrels are recorded. 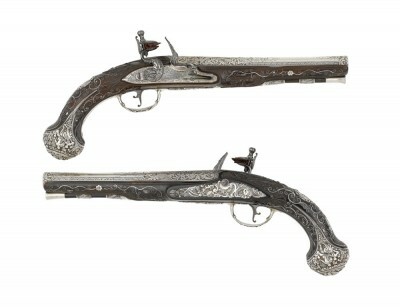 Two pairs of half-stocked silver-barrelled pistols were made in the Lucknow Arsenal in about 1785 and both are decorated in almost identical fashion to this pair. They are described and illustrated in Howard L. Blackmore, ‘General Claude Martin, Master Gunmaker’, The Canadian Journal of Arms Collecting, vol. 27, no. 1 (February 1989), respectively p. 10 and p.11, pls. 10-11 and 12-13.